Who hasn’t heard of the Uncharted series? Critically acclaimed, high selling, and action-packed, this is one of the most prominent video game franchises out there. As a big Indiana Jones fan, I have been on board with the series from day one and have played all the games, including the PSVita prequel. Uncharted 2: Among Thieves is probably one of my favorite video games of all time. However, I was a bit disappointed with Uncharted 3: Drake’s Deception, thinking it was a bit redundant and a little lackluster. Regardless, I was extremely excited for play Uncharted 4: A Thief’s End when it was announced. Now that I’ve finished it, let’s look into the latest and probably final installation in the Uncharted series. The story of the game is your basic adventure plot, that follows our protagonist Nathan Drake. “Guy gets the opportunity to find this ancient treasure by his long lost brother. It’s a race against time against the other people who want the treasure, who aren’t as nice or as good as our hero. Coming along is a quirky cast of characters and a love interest too! Who will get to the treasure first?” This sounds so simple, yet it isn’t at all. 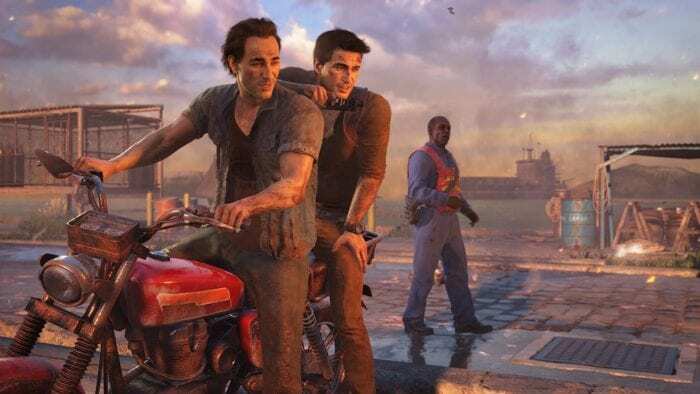 While on its face, the plot is nothing impressive, Naughty Dog is a master of storytelling. As always, they take the most basic of plots and spin it into a grand tale of adventure that grips the player throughout. The setting is portrayed perfectly. The pacing is as good as any action movie. Gameplay and You really care for the characters and want them to succeed. The twist was one that really upset me even though I expected it. With Uncharted 4, Naughty Dog reinforces their reputation as the best in the business. The gameplay is very similar to other games in this genre. It’s a third person shooter that mixes in quite a bit of puzzles. The game is about equal parts combat and exploration. The formula has been done enough that I had gotten tired of it by Uncharted 3. However, this game allows for more stealth than previous iterations. Every encounter that isn’t forced by the story can be passed by stealth. I don’t think I shot a single bullet I wasn’t forced to throughout the whole game. One thing that I also liked was that your AI companions were actually useful. When you were sneaking, they would also be sneaking. They would help you out from tight situations and would take the initiative while you were otherwise occupied. There were enough interesting twists added to this basic formula that kept me engaged. Nathan Drake and his brother, Sam. If you’re playing Uncharted, you know these characters already. They are all developed further throughout the story and none of them felt like they were unnecessary. However, I don’t want to spoil too much. Let’s talk about the new characters: Nate’s brother, Sam, and the new villains, Nadine and Rafe. Sam, voiced by Troy Baker, fits right in with the Uncharted world. He is in perfect sync with Nate and they really do seem like brothers. His absence from previous games is explained well enough that I can be okay with him just showing up. The villains are a mixed bag. Rafe, is the typical rich guy who wants to find the treasure. While unoriginal, he’s pretty freaking competent and actually poses a real threat. Nadine, who is voiced by the ever versatile Laura Bailey, is a great villainess. She heads the mercenary corp that serve as the primary mook body for the game. She’s competent and tough as nails, you can never doubt for a second that she really could lead these guys. The new additions add even more to a great cast. One of the gorgeous landscapes in Uncharted 4. I don’t really think I need to go into this that deeply, the graphics are amazing. There’s been so much said that I don’t think I can add anything. Once again, Naughty Dog brings the best out of the system. This is their first effort on the PS4, so I was excited to see what they could do. The environments are gorgeous, whether it was a bustling market or a large savannah. The characters are rendered wonderfully and they are extremely expressive. If I saw this from the corner of my eye I would think I was watching a movie. Nate and the new villainess, Nadine. The music of the game is top notch. The score, which I had felt was getting stale in Uncharted 3, has been revamped by new composer Henry Jackman. Jackman, who is known for his work on the Captain America films, along with many other hit movies, really brings that movie vibe to the games. The score was dynamic and changed with the mood enough that it felt like one large adventure movie. Each piece matched the mood of the scenes they were played against. 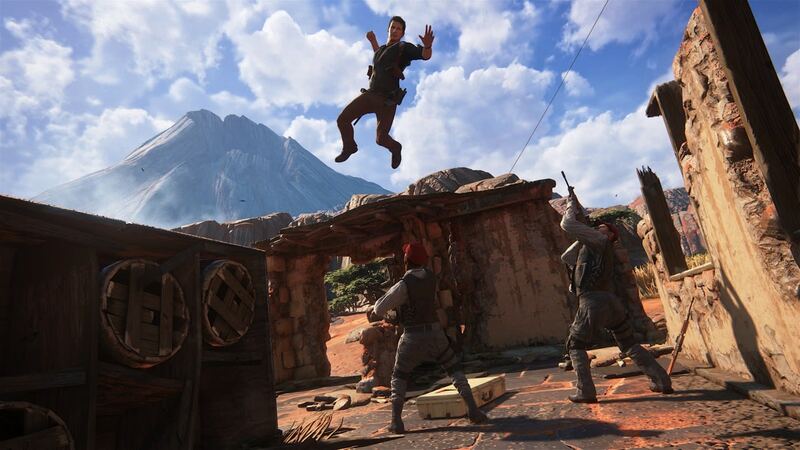 There is one aspect of Uncharted 4 that I have failed to address, the multiplayer. To be honest, I kind of forgot it existed. However, I did spend quite a bit of time playing it after I completed the single player. It was, serviceable. It had a variety of modes and characters that are definitely interesting. However, I didn’t like that it was a “pay-to-win” model, in that the best weapons could be bought early with real world money. I rather a game that’s more balanced when everyone is on a level playing field. I also found melee attacks to be a bit ridiculous. A person who was getting shot at 5 times could kill their shooter with a few punches. The multiplayer seems like an afterthought and I’m going to treat it that way. Also, I got to play Crash Bandicoot, the game is automatically good for that. I prefer to give recommendations than an actual score, but I give a score that reflects my weighted impressions as a fan of the series. Naughty Dog has upped its game again with Uncharted 4. This game was made for the fans. As you can see, they just perfected what worked before. If I was forced to give the game a score, I’d give it a 9.0/10. I play Uncharted for the story and adventure and it delivered. It’s now my favorite Uncharted game after Uncharted 2! If you’re a fan of the genre or series, definitely check it out. If you’re new, I really recommend giving the series a try!